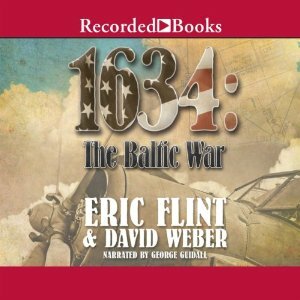 1634: The Baltic War, although a weighty volume in its own right, is but one stitch in the giant tapestry that is Eric Flint’s sweeping Ring of Fire series. The series imagines the tumultuous Thirty Years War in seventeenth-century Europe disrupted by the arrival of a small West Virginia town sent back in time from the year 2000 by a freak cosmic accident. As masterfully told in the series opener 1632, the injection of modern technology and ideas into this bleak post-Reformation world has immediate and far-reaching consequences. The synopsis for 1634: The Baltic War illustrates just how much things have changed. The Baltic War which began in the novel 1633 is still raging, and the time-lost Americans of Grantville – the West Virginia town hurled back into the seventeenth century by a mysterious cosmic accident – are caught in the middle of it. Gustavus Adolphus, King of Sweden and Emperor of the United States of Europe, prepares a counter-attack on the combined forces of France, Spain, England, and Denmark – former enemies which have allied in the League of Ostend to destroy the threat to their power that the Americans represent – which are besieging the German city of Luebeck. Elsewhere in war-torn Europe, several American plans are approaching fruition. Admiral Simpson of Grantville frantically races against time to finish the USE Navy’s ironclad ships – desperately needed to break the Ostender blockade of the Baltic ports. A commando unit sent by Mike Stearns to England prepares the rescue the Americans being held in the Tower of London. In Amsterdam, Rebecca Stearns continues three-way negotiations with the Prince of Orange and the Spanish Cardinal-Infante who has conquered most of the Netherlands. And, in Copenhagen, the captured young USE naval officer Eddie Cantrell tries to persuade the King of Denmark to break with the Ostender alliance, all while pursuing a dangerous romantic involvement with one of the Danish princesses. 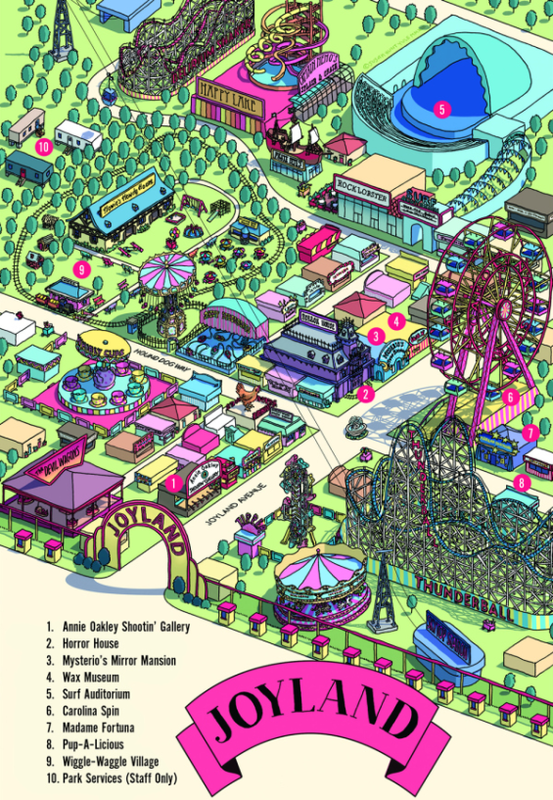 This overview gives a sense of the novel’s sweeping scope, both geographically and in terms of content. In some ways, this book and the series as a whole brings to mind Neal Stephenson’s ambitious Baroque Cycle, but while Stephenson’s work focuses on scientific and cultural developments Flint and Weber, at least in this volume, are telling a story of war. This isn’t to say that culture is absent from the chapters of 1634. Indeed, the novel draws both insight and humor from the juxtaposition of modern popular culture and European values. In one early scene, for example, a concert features classic Baroque harpsichord followed by a modernist piano concerto featuring music by Chopin and closing with twentieth-century Christmas songs. It’s also amusing to hear Europeans try and puzzle out exactly who this Elvis Presley character was. While, as I said, 1634: The Baltic War is a military novel, and does feature occasional scenes of violence and hardship, overall its tone is light and even casual despite the depth and complexity of the book’s subject matter. While this renders the book almost instantly accessible, I can’t help but feel that at times the lack of gravitas fails to do justice to the enormity (in its original sense) of the Thirty Years War. To return to the previous comparison, Stephenson’s writing in the Baroque Cycle is much more opaque and, well, baroque, but the style seems to suit the subject matter. On the plus side, the story benefits from Eric Flint’s considerable experience in writing alternate history along with David Weber’s military background. Despite the world’s massive scope, every corner of it feels lived in and fleshed out. George Guidall takes on the arduous task of bringing together seventeenth- and twentieth-century characters and cultures in this melting pot of a novel, and as usual Guidall is up to the challenge. From the brusk military clip of Admiral Simpson to the slight lilt of the larger-than-life Gustavus Adolphus, Guidall makes every element of the story from both past and present come alive. Listeners who love military fiction, alternate history, or time travel can’t go wrong with 1634: The Baltic War, though to fully appreciate the novel they would do well to begin with the first installment in the Ring of Fire series, 1632. As perhaps is inevitable with a series of this magnitude, there are flaws and aspects that fail to please. 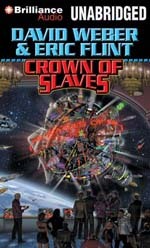 But this book is only one chapter in what might just be Eric Flint’s magnum opus. Honor Harrington has survived ship-to-ship combat, assassins, political vendettas, and duels. But this time, Honor and her crew, ambushed and captured, are aboard an enemy ship, bound for a prison planet aptly named ‘Hell’ – and her scheduled execution. Yet the one lesson Honor has never learned is how to give up. She and her people are going home – even if it means conquering hell to get there! 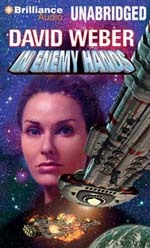 Weighing in at nearly twenty hours, In Enemy Hands is the seventh volume in the Honor Harrington series by David Weber. If you’re new to this series, I highly urge you to start at the beginning with On Basilisk Station. This is solid military SF and if you can overlook the unnecessary info-dumping that Weber appears to frolic in at length, this is outstanding stuff. The action scenes are crisp and well presented. And while there are a few ship-to-ship battles, most of the action occurs hand-to-hand. Weber does a pretty nice job at teasing tension out of the story but when he shifts into exposition, and this happens far too frequently, the earlier tension is lost and the reader is left to flail about in the sudden slackness of superfluous narrative. You know that person who talks and talks for no other reason than they like the sound of their own voice? Yeah, this is how it feels when you hit one of these info-dumping spots of Weber. But if you can tough it out and just grit your teeth, you’ll be rewarded with a fun and exhilarating military SF story with believable characters that you can root for. Allyson Johnson narrates this audiobook, and all I can really say about her reading is that it is tolerable, but just barely. I feel a good reader should become the story rather than assuming the role of performer. If I listen to a book and am consciously aware of the narrator, the reader has failed. Not once was I able to focus on Weber’s story without being painfully aware of Johnson’s jarring and awkward rhythm. It felt as if she, Johnson, wanted to convince anyone who was listening that she “could” do the job of reading. Too many narrators try too hard to do their job when all they really need to do is read, just read, nothing more. It’s like climbing up a really tall ladder. Everything will be fine so long as you just climb. You only get into trouble when you start thinking about climbing. The Star Kingdom’s ally, Erewhon, is growing increasingly restive in the alliance because the new High Ridge regime ignores its needs. Add to that the longstanding problem of a slave labor planet controlled by hostile Mesans in Erewhon’s stellar back yard, a problem which High Ridge also ignores. Finally, the recent assassination of the Solarian League’s most prominent voice of public conscience indicates the growing danger of political instability in the League – which is also close to Erewhon. In desperation, Queen Elizabeth tries to defuse the situation by sending a private mission to Erewhon led by Captain Zilwicki, accompanied by one of her nieces. When they arrive on Erewhon, however, Manticore’s most capable agent and one of its princesses find themselves in a mess. Not only do they encounter one of the Republic of Haven’s most capable agents – Victor Cachat – but they also discover that the Solarian League’s military delegation seems up to its neck in skullduggery. And, just to put the icing on the cake, the radical freed slave organization, the Audubon Ballroom, is also on the scene – led by its most notorious killer, Jeremy X. Multiple articulated segments valiantly strive to give shape to this story. At times they move in joint cooperation and at others, they do not. This coauthored book is the first in what is being labeled the “Honorverse” series. It is said that it will launch an exciting new telling that… I’m sure you get the idea, or at least the idea that the publishers and Weber might wish you to have. The story appears simple at the surface. We encounter issues of slavery, the incessant pursuit of power, ill-conceived notions of political philosophy, religious ranting, and a whole lot of exposition. Yes, this seems simple, right? And to some degree it is. But a recipe merely listing the ingredients does not guarantee a tasty delight on the tongue. Or in this case, the literary palate. David Weber is a talented writer. Unfortunately Weber’s skill is not on display in this book. First off, I don’t like writing reviews wherein I simply dump on an author’s book. It is easy to criticize something and all too often we tend to focus on the negative more than the positive. As I indicated, David Weber is a gifted writer in the military science fiction genre. 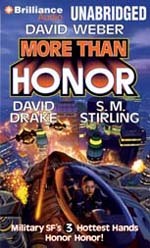 His first volume of the Honor Harrington series On Basilisk Station is a fine read. But this book lacks Weber’s eye for craft. The sheer tonnage of exposition in this book is staggering. I’m not a fan of the information-dump, and I am especially not a fan when you are strapped down and force-fed it until your eyes glaze over. Flint and Weber’s ability to provide the reader with a strong foundational understanding of the rationale behind all character and political motivation is stunning. In many ways this book has the feel and tonality of a history book. You learn who did what and then why. This knowledge then is the underlying cause for the action of a character that you will now be told about. And perhaps this is my core issue. I felt as if this story was told to me and not shown. If this had been a lecture about lectures, it would have been more interesting than this book. Aside from massive droughts of exposition, flat characters, and shoddy dialogue, come the issue of adverbs. If you are reduced to using adverbs in dialogue attribution in order to tell the reader how someone says their lines, it is up to the editor to politely ask (demand) the author to rewrite. This book is full of adverbs and awkward transitions between metaphors and similes that are rarely rendered well. Peter Larkin serves as narrator. And while his performance is better than I’ve heard in the past, he still injects far too much drama into his reading. His interpretation of youthful characters is distracting at best and downright irritating for the most part. Larkin doesn’t fall into the pitched cadence reserved only for air traffic controllers but comes dangerously close on several occasions. If Larkin can set aside the idea of performing and just read, he’ll do well in the business. The musical score at the beginning and end of each CD is too long, too dramatic, and distracting to the extent of making it difficult to hear the narration under the music. In this case, a little goes a long ways. New York Times bestselling author David Weber invites David Drake and S.M. Stirling, two of today’s top writers of military science fiction, to join him in an exploration of Honor Harrington’s universe. More Than Honor consists of the following four parts. A Beautiful Friendship by David Weber, narrated by Khristine Hvam. A Grand Tour by David Drake, narrated by Victor Bevine. A Whiff of Grapeshot by S.M. Stirling, narrated by Khristine Hvam. The Universe of Honor Harrington by David Weber, narrated by L. J. Ganser. This collection starts and ends strong, but unflatteringly sags in the middle. The story “A Beautiful Friendship” is a short work introducing Stephanie Harrington and the first bonding between humans and treecats. It’s a powerful piece and Khristine Hvam narrates it with skill and style. David Weber later lengthened this short story into a novel, which now is on my to-read list. This collection is worth picking up if for no other reason than to simply read this first story. I know for those of you who aren’t familiar with Honor Harrington and treecats, the idea of a six-legged cat might seem weird, it’s not, well not really. Trust me on this, just go with it and all shall become groovy. The following two works in this collection were in my opinion, unneeded baggage that added little and entertained less. “A Grand Tour” by David Drake, narrated by Victor Bevine, tells the story of a largely forgettable cast of characters doing stuff that really doesn’t matter to anyone outside of the narrative. Going from “A Beautiful Friendship” to this was like going from steaming jets of hot water shooting from the showerhead to being sprayed down in county lockup with a fire hose gushing ice water. Victor Bevine as narrator gives a solid effort though at times, I felt he was overdoing it and this contributed to my overall sense of “Mehh” for this piece. “A Whiff of Grapeshot” by S.M. Stirling, narrated by Khristine Hvam, wasn’t as bad as “A Grand Tour” but still, not great. Stirling does tie this into the Honor Universe and Khristine Hvam gives another outstanding performance as reader. Others may find this short story enjoyable and if you are one of these individuals, I can understand why you may like this. I however found it lacking any sense of urgency and as a result, I felt unengaged for the duration of this short work. This collection concludes with an appendix providing a wealth of historical reference to the Honor Universe. For those of you who are into this series, I highly recommend reading this. L. J. Ganser narrates this final section, “The Universe of Honor Harrington” by David Weber. And for what it’s worth, Ganser does a great job of reading mostly historical exposition. I found some of this material to be fascinating while some of it was dry and skim-worthy but still, good stuff to read through. In the end, I’d say it’s an okay expansion pack but falls short of what it promises. Sadly, this collection doesn’t even come close to scratching the military SF itch like Weber has done in the past with his earlier Honor Harrington books. I was left wanting more treecats and more space battles.